Production begins the business day following receipt of PO and approved, usable art. Art modifications or changes require additional lead time. Lead times are based on orders up to 5,000 pieces. For larger quantities, call for production times. Custom dies require 3 additional work days. Packaging requires additional production time determined by the type of packaging required. Order with Production Proof: Production time following proof approval is 5 days. Rush options are available. When the FREE PDF "Paper" Proof is sent for "reference ONLY", it means production will begin without waiting for PDF proof approval. This PDF is not an accurate color proof – use for design reference only. 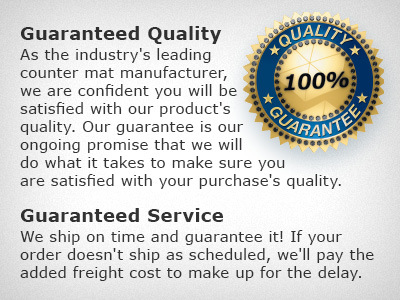 DIGISPEC® mouse pads are distributed exclusively through qualified promotional product distributors. Contact your favorite ad specialties professional for information. Please read our legal page before using this site.